Cheeky chasing down Tioga through the water. This weekend Marc had to go out of town for a training thing, so Jenny was playing single Mom. After a week full of work travel (she was working in Northern Wyoming and Western Colorado for the majority of the week) Cheeky needed some serious exercise. And even better — the weather forecast was scheduled to be GORGEOUS! Jenny called up Hilary — you’ll remember that we recently had a girls trip to Garden City — to see if Tioga might want to join in for some fun at Cherry Creek State Park. Splashing around with the big dogs! Tioga and Hilary were in! So we met up in Aurora and carpooled in to the park. Side note — if you can carpool here, please do! The parking lot is tiny and there is often a one in, one out wait! Cheeky working on a bumper retrieve. Tioga and Cheeky had a BLAST. We brought some bumpers to start working on water retrieves which was some homework from our last NAVHDA training day. They both did a great job retrieving! We stuck to shallow water for this outing, but we definitely think Cheeky will likely be a little fish like her Mommy Halo! 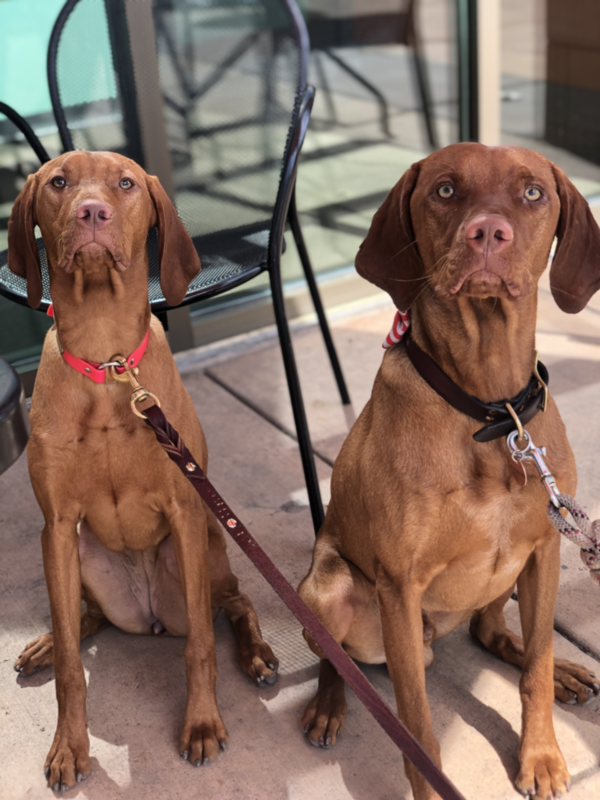 After a good 1.5 hours at the park, we loaded up and took them with us to enjoy a little patio lunch on this perfect Colorado day. With hugs goodbye, we headed home, and the day can definitely be marked down as a success, because Cheeky slept the WHOLE rest of the day! ← Karma takes High in Trial at Barn Hunt!